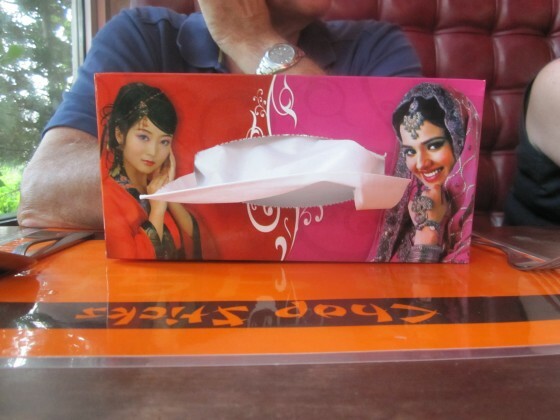 You need half a box of flimsy tissues in Jordan to get the job done. Is there a greener way to dry your hands? Use more than a single sheet of paper towel per day – prefolded singles, the kitchen kind with perforated tear lines, or auto-cut by dispensers – and you’re a paper towel overconsumer. You know who you are. Bet you also grab more paper napkins than you need at take-out places. But today we’re talking paper towels specifically used to dry our hands. Reduce usage by just one towel per person per day, and divert 571,230,000 pounds of waste from the yearly trash heap. And that’s just in the USA. Tissues are really awful for drying anything; too flimsy and tearable. Use half a box to get the job done. I’ve begun to channel my long-gone Italian granny, never leaving the house without my own stash of paper towels. So this primer in hand drying really resonated with me. At a recent TEDx event, Joe Smith, advocate for proper paper towel use and former chair of the Oregon Democratic Party, demonstrated how we can conserve over half a billion pounds of the stuff each year by adopting his “shake and fold” hand drying technique. Wash you hands properly, then shake ’em 12 times. Pat dry, pat proud: know you’re a friend of the planet. Repeat a couple more times to fully absorb the lesson. Now you’ve learned the trick to sustainable hand drying. Smith’s talk at Concordia University in Portland, Oregon was filmed and shared through TEdx, a subset of the non-profit TED (Technology, Entertainment and Design) program of local, self-organized events on “ideas worth sharing”. Joe promises to back on the speaking circuit soon, next time addressing toilet tissue.